News ► Drop Gauge Increased in DDDHD and 0.2 Objectives Translated! Despite not being a well received addition to the Kingdom Hearts gameplay, the Drop Gauge is staying in the HD re-release of Kingdom Hearts Dream Drop Distance HD. Today, the Japanese Kingdom Hearts HD II.8 Final Chapter Prologue website updated with new screenshots, which you can view here, as well as some new information about the gameplay of Dream Drop Distance. 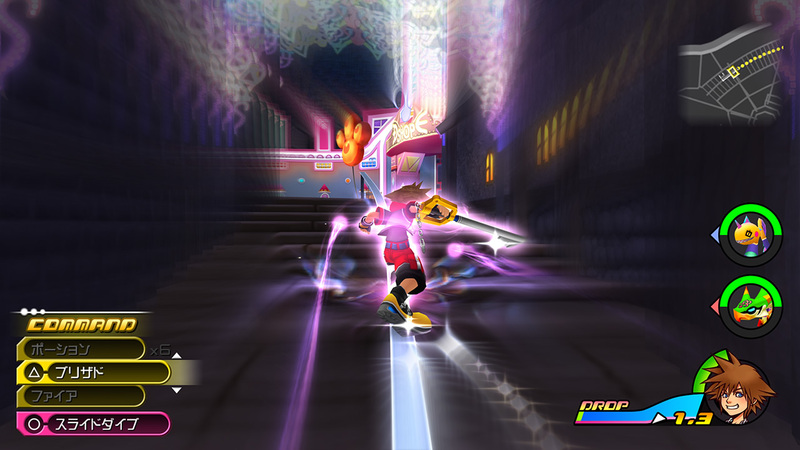 Previously, the Drop limit in 3D Dream Drop Distance was capped at around 10 minutes, and could be slowed down through items and/or spending Drop Points (accumulated from defeating Dream Eaters and spending them when swapping between Sora and Riku), or increased in bad weather and/or status effects. 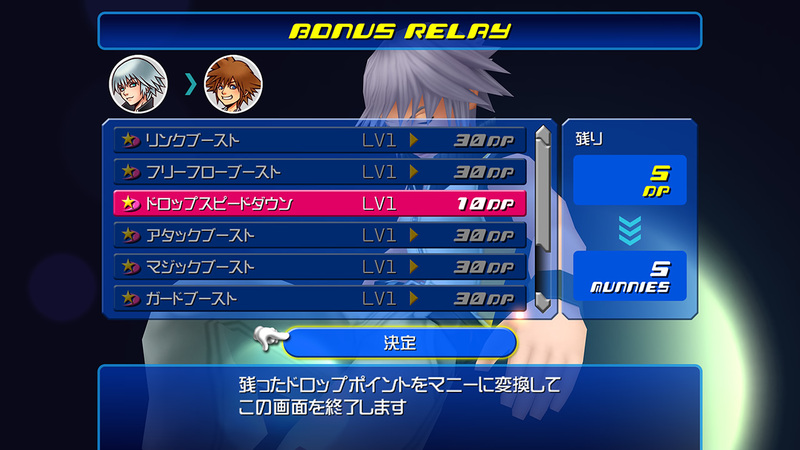 Now, in the re-release, the Drop gauge will deplete after 20 minutes, allowing you extra time to explore the worlds as Sora and Riku. 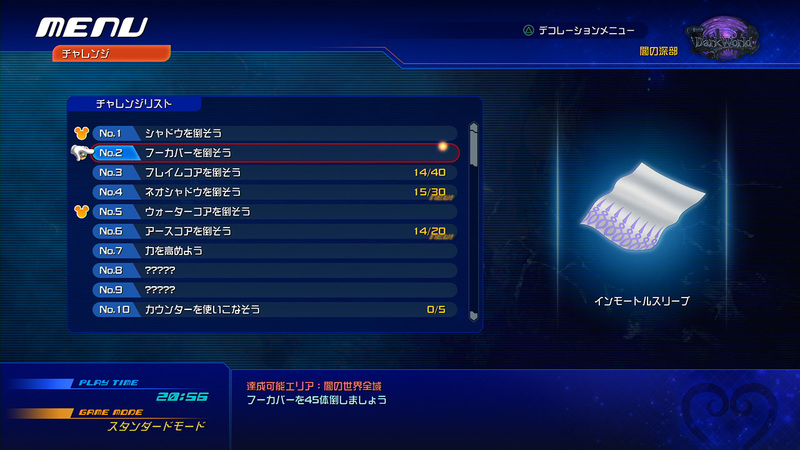 In Kingdom Hearts 0.2 Birth by Sleep -A Fragmentary Passage-, objectives have been added to add extra challenge to the game. Completing these challenges rewards the player with material and other customisable items. As this is the start of the list, more challenging and difficult objectives should follow, providing hours of extra content. Translations thanks to Saken and Zephyr. Why am I the only person who didn't have issues about the Drop Gauge? I never drop once in bosses, but hopefully no one is still dropping in DDDHD. Occasionally I would drop at inconvenient times in my first playthrough, but I never felt like it was unfair. The game gave me this rule and it's on me to work with it. That said, I welcome a more forgiving Drop gauge. I've really only had issues with inconvenient drops during my LV1 run of the game (war flashbacks from the Spellican), but this change is welcome nevertheless. It's nice to not have to fill one/two command slots with Drop-Me-Nots/Nevers. Sigh, I guess I don't do things that are the fault of me and not the Game. I never had issues either, but I guess I can see where people might have had issues.... I guess. I never had issues with dropping. I made sure to save at save spots before bosses, if my drop gauge felt too low I'd just drop out or use a drop-me-not. I tried to avoid bad forecast conditions and if there was one I'd just use the time to grind as much as possible. Personally I rarely ever had any problems with the gauge. It was only a problem in, like, one or two boss fights. Either way I am glad to see that it has been extended regardless. The objectives are interesting. It's amazing to me how we have seen so much of 0.2 and yet so little. I love how much effort and work they are putting into it. I still don't even know what the forecast stuff even means to be honest. I am the worst player ever, but yes, I always stayed stocked on drop-me-nots even though I never equipped them. The only boss I'm stuck on is Ansem SoD because it's super annoying when he throws me allll the way to the back of the room when I only just made it to the front and barely got any hits in. It's super disorienting, so I can't wait to play it on a bigger screen and a controller. I don't know why people were expecting the drop gauge to be gone entirely. They'd have to completely rework how you switch characters into a linear scenario or a BBS situation, which probably would've been more work than they would ever have wanted to do for this. You can drop manually and are required to finish all worlds in a "ring" with both characters before moving on, creating natural walls to force dropping. It frankly wouldn't have been that hard. I don't know why people were expecting the drop gauge to be gone entirely. Because for months the Drop Gauge was missing from official screenshots and trailers despite every other UI element being visible on screen so there was cause to believe it had been taken out. Plus people just hate the damn thing. I'm actually glad. I always felt like I didn't have enough time - I'd always drop in inconvenient times. And I never wanted to equip items because I didn't want to waste slots..
You could just equip a Drop-Me-Not, pop it, and replace it with whatever was there before. I dropped like once during the Monstro boss fight with Riku. Never had much trouble either. I mean it's okay, I just don't see the need for drop-me-nots anymore then. For those wondering, the Water Cores were seen in the Kingdom Hearts III E3 2015 trailer, as well as the Kingdom Hearts HD II.8 Final Chapter Prologue TGS 2016 trailer. I also think this is the first time we've seen an Earth elemental Heartless. Can we all take a second to appreciate how cool the dark world logo is. To be honest I never understood the wailing in regards to the Drop Gauge, as it added some strategic element to the whole experience requiring players to plan ahead and actually weigh if one should take on a level's boss or not (if you don't reset the gauge via item). But then again, I also never understood the "hate" and complaints about CoM's card system which in my personal view has a wonderful strategic and planning component to it.